Spring is the best time to repot water lilies into larger pots to keep the roots from becoming congested. 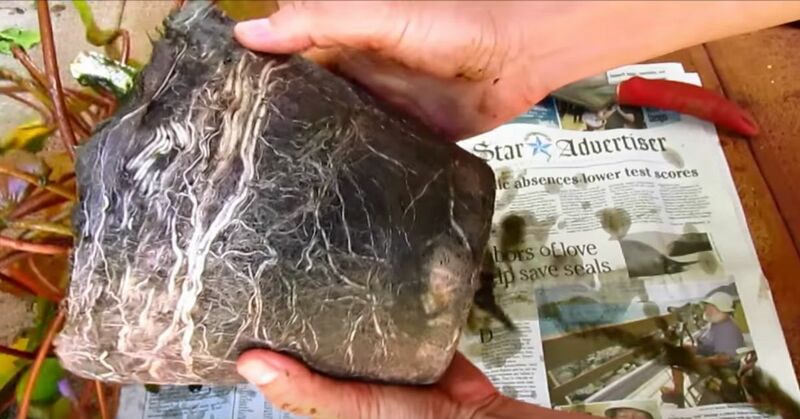 Crowded roots will keep your plants from blooming as frequently. Repot them annually (typically in April), and then every two or three years you’ll want to divide the plants before repotting them. For most water lilies that are average-sized to large, a five- or seven-gallon pot, which should be wide and shallow, works well for repotting. Remember to use clay-based topsoil or an aquatic loam to repot. Commercial potting mixes will not work. Waterlilies have long, fleshy roots called rhizomes. The growing tip is that part of the root from which the leaves emerge. You can cut the rhizome to within 4 or 5 inches of the growing tip. Opinions vary as to whether the pot should be solid plastic or meshed and lined with hessian. Either way, fill it about a third of the way with soil. Then sprinkle in one tablespoon of fertilizer and mix it thoroughly. If you use aquatic feed tabs, push two of them halfway into the soil. The trench should run from the center of the pot to the side. Place the rhizome in the trench with the growing tip pointing toward the center. Spread the roots so they are not squashed under the rhizome. The soil should cover the roots and fill in around the rhizome without burying it. The point of the crown should not have soil on it or it could have difficulty sprouting new leaves. Firmly push down the soil to remove any air pockets, and gently add some water to the container. Top off the pot with a 1/2” layer of sand first and then a 1” layer of pea gravel. The gravel adds weight on top of the rhizome to keep it from floating loose from the pot once it's in the water. Place your plant in the shallow end of the pond with no more than six inches of water above the pot. Keep it at that depth until new growth appears, which could be as early as one week. About two months after repotting your water lily, start fertilizing it with two aquatic feed tabs. Do this every two weeks until October.